Given the choice between two duos of hilariously mismatched size and sensibility, audiences gave the slight edge to Monsters University over The Heat this weekend, preferring to watch a bickering friendship blossom against the ivory walls of monster academia, rather than the far uglier streets of South Boston. Still, The Heat’s $40 million take was a much bigger victory than its second-place finish might suggest: Not only did its opening outpace Bridesmaids, it also beat out The Blind Side to become Sandra Bullock’s highest-opening film ever, reaffirming the film’s overarching lesson that Sandra Bullock should just loosen up and do some drunk hip-hop dancing. 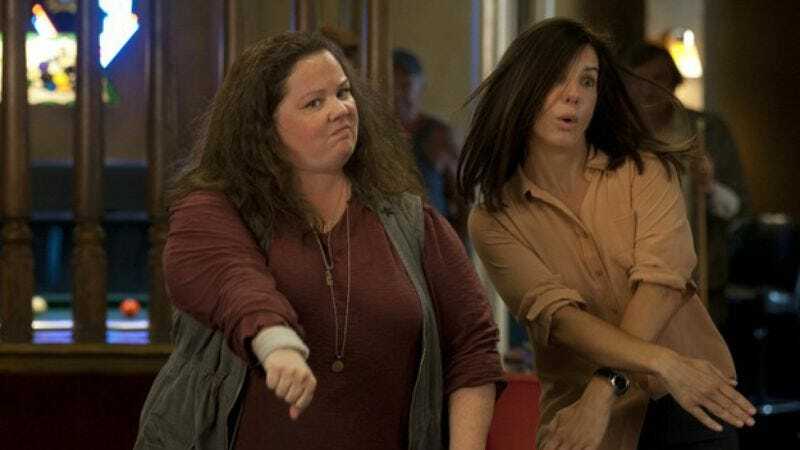 It also suggests that ye olde buddy-cop comedy is a genre that still manages to excite audiences so long as its recognizable tropes are filtered through females, news that regrettably comes about 25 years too late for Rebecca De Mornay and Mary Gross. Illustrating that point was the rather underwhelming opening for White House Down, a film in which one of the cop buddies is actually the President of the United States—but, as both of the buddies are still dudes, is only worth about $25.7 million at the box office. Other factors beyond audience fatigue with traditional gender roles likely contributed to White House Down’s fourth-place finish, from conservative backlash against the film’s romanticizing of Obama to something that actually matters, such as the fact that audiences were pretty sure they already saw this movie back in March. Beyond the multiplex, Pedro Almodóvar’s I’m So Excited—in which the buddies are the comically mismatched seating classes on an airplane—took in $103,000 in five theaters; buddy-punk rockumentary A Band Called Death scored $28,500 in 13 theaters; and it was $18,000 in six theaters apiece for Neil Jordan’s buddy-vampire flick Byzantium and the Jason Statham-starring Redemption, which explores the rarely tapped buddy pairing of gangsters and nuns.